"A Presenter of Theater Arts to the New York Community Since 1987." 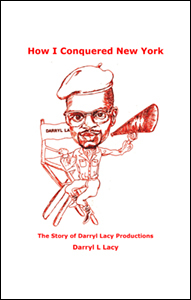 Darryl L. Lacy has released his new book, How I Conquered New York: The Story of Darryl Lacy Productions! Actor, writer, director, and producer Darryl L. Lacy founded Darryl Lacy Productions thirty years ago. He has released a new book that tells how he developed the company. To purchase a copy, click here.